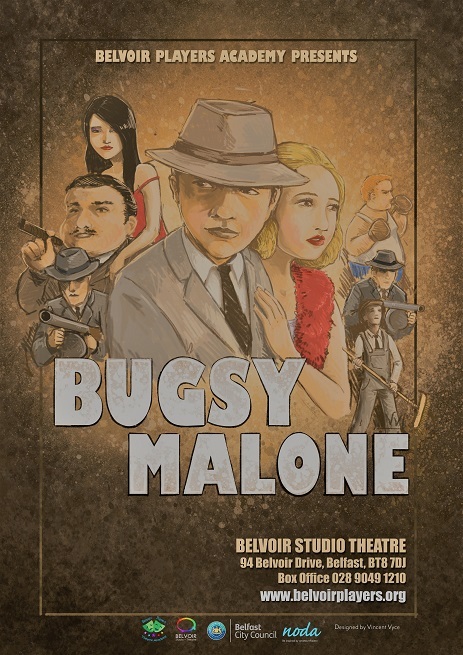 Belvoir Players Junior Academy bring on the fun...Based on the hit 1976 film by Alan Parker; Two gangs comprised completely of children, square off in a 1920s rivalry of Capone-ian standards. Dandy Dan's gang has gotten the upper hand since obtaining the "splurge" gun (a weapon that shoots whipped cream). Now, Fat Sam and his bumbling buffoons are in real trouble! Bugsy Malone, a one-time boxer, is thrust not-so-willingly into the gangster limelight when he becomes the last chance that Fat Sam's gang has of surviving. All Bugsy really wants to do is spend time with his new love, Blousey, but that just isn't in the cards for our hero. Bugsy Malone is a master class in musical comedy.